Please read this section carefully and direct questions to Chris Williams at 720-473-7671 or williams@BrewersAssociation.org. All festival beer must be sent with a no-charge/$0 invoice indicating that your GABF beer is donated. This will be emailed to all festival breweries prior to shipping. Be sure to attach this to your festival beer shipment, as well as provide a copy to williams@brewersassociation.org and the point person who receives your beers at your chosen drop- off point. Sending Your Own Kegs? – The GABF only accepts kegs that are refillable stainless steel or single-use plastic kegs. No exceptions. If you have any questions about acceptable kegs at the festival, please email Chris Williams: williams@BrewersAssociation.org. After the festival: all brewery-owned kegs (non-MicroStar), must be picked up from the Colorado Convention center on Sunday, September 23, before 12:00 pm (noon). The GABF is not responsible for any kegs left after this time. Deliver a minimum of 5-7 cases of each brand in bottles or cans to your collection point for shipment to Denver, Colo. Your local distributor may also deliver your beer to the Brewers As- sociation GABF warehouse in Louisville, Colo. during the delivery window. All beer entered in the festival must be delivered to the GABF host dis- tributor for legal and inventory purposes. Festival beer received by the host distributor becomes the property of the host distributor for GABF and may not be used for any other purpose such as selling at retail. The GABF works with MicroStar Keg Management to ship kegs directly to your brewery to fill with your festival beers. If you request MicroStar kegs, they are shipped directly to your brewery (pickled and passivated) at no cost to you. Fill them, label them up with the assigned GABF keg tags, get them to your chosen drop-off point, and they’ll meet you at the festival. Once the festival is over, your job is done, and you won’t have to worry about handling any kegs. Click here for a handy infographic showing you how it all works! Any participating GABF brewery who is not currently a Micro Star client (current Micro Star clients are required to send their own MicroStar kegs as well). Any brewery choosing to receive MicroStar kegs will receive 2 – 1/6 barrel kegs for every brand you are sending for the festival. (Breweries in the Meet the Brewer hall at the festival will receive one 1⁄2 bbl per brand). Current MicroStar clients should use their existing inventory and will receive credit from MicroStar for the kegs sent to the festival. For existing MicroStar clients, please send no more than one 1⁄2 barrel per brand unless you his- torically run out of beer. If your brewery has previously run out of beer at the festival, you may request additional kegs by emailing Chris Williams at williams@brewersassociation.org by July 26. You will receive Grogtags in the mail in August. There will be one tag for every keg you indicated during registration. Please fill out the style field on each tag. Tags were not sent for case product. For case beer, you should tape the following label to each case you’re are sending. IF A BEER HAS CHANGED FROM THE TAGS YOU RECEIVED – Cross out the old name and write the new name in the “style” field (no need to add “style” for the beer if you’re making this change. 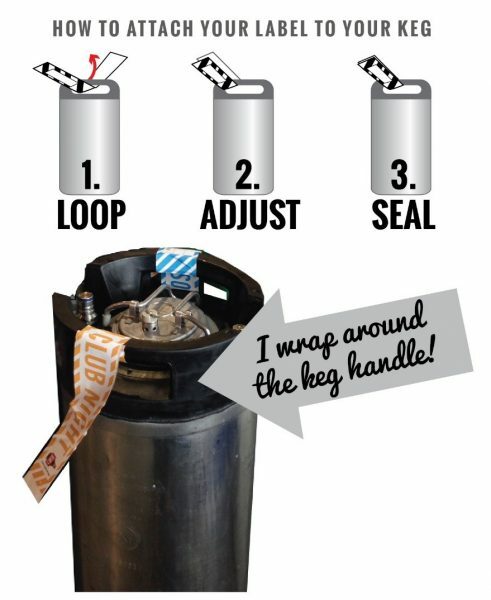 The tags should be placed on the handle of your kegs. The tags are applied like luggage tags and fold over onto themselves.